The mission of the social work profession is "to enhance human well being and help meet the basic human needs of all people, with particular attention to the needs and empowerment of people who are vulnerable, oppressed and living in poverty." 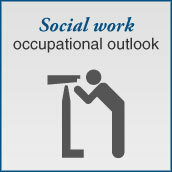 Social work addresses the needs of individuals, families, groups and communities. The core values of the profession are service, social justice, dignity and worth of the individual, importance of human relationships, integrity and competence. St. Scholastica's social work program embraces the mission of the social work profession in the context of the College's Benedictine tradition. The program, accredited by the Council on Social Work Education, requires graduates to be well prepared for beginning generalist professional practice. The Social Work Program will provide students with the analytical and substantive knowledge essential for beginning generalist social work practice. The Social Work Program will foster the mission of the college and the values from our Benedictine heritage - community, hospitality, respect, stewardship, and love of learning. The Social Work Program will provide continued preparation of students for graduate education. The College of St. Scholastica Social Work Program prepares students in the generalist social work method emphasizing beginning practice with individuals, families, groups and communities. The Social Work Program is guided by the liberal arts tradition of the college and integrates a humanistic, equalitarian philosophy with rigorous, sequential academic programming. Because different learners have different needs, we offer our Social Work program in several formats and locations. Our traditional day program at our Duluth campus is a full-time, residential college experience. Our accelerated evening and weekend programs are designed to meet the needs of adults with a variety of commitments, including work, family and other obligations.